JACK SCHAEFER / ARIZONA DAILY STAR 1970 Firefighters at the Pioneer Hotel fire bring down some of the survivors on an extended ladder. Many hotel guests weren’t as lucky and died jumping from windows of the 11-story hotel. Every December for the past 40 years, Albert Pesqueira thinks about the devastating fire at the Pioneer Hotel. He remembers what he saw and felt that night as a rookie firefighter. But this December he will bring his memories to life. 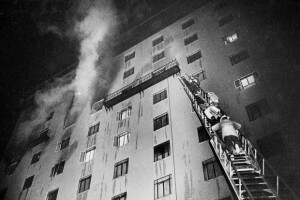 Pesqueira is the creator of “Hot Pion: The Pioneer Fire Documentary,” a commemorative documentary of the 40th anniversary of the Pioneer Hotel fire that left dozens of people dead. The documentary will premiere at the Fox Theatre Dec. 19 featuring a collection of photographs and video footage from the night of the fire, and recent interviews with people who were there that night, Pesqueira said.